Probably the most beloved of all Berghaus rucksacks, the Vulcan represents an older, military design - simple and robust. 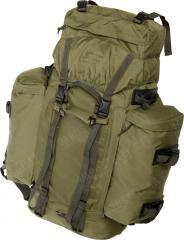 An excellent ruck for military use and works equally well in civilian excursions, without even looking too warry. Along with the obvious choice as a hiking rucksack, this works wonders for the traveller too: sizewise it can be adjusted to ease navigating in dense traffic (trains! God-damn trains!) by removing the side pouches, and the not-so-overtly-military appearance could really be an important factor in some places. 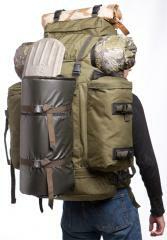 The most important thing is that the ruck will not disintegrate on you. Lower main compartment, closes with a strong zipper. 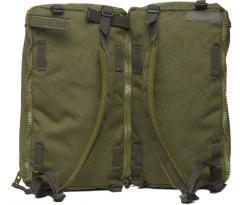 Removeable side pouches, capacity 10 liters each. The side pouches can be attached to one another and carried as a daysack. The side pouches are secured by two horizontal straps each, which can be used to compress the main compartment. A large pocket outside the main flap. A stiffened, well padded waist belt with a studry plastic buckle, either of Berghaus' own design or the usual Fastex type. All materials used are high quality, combat proof polyester and nylon, YKK zippers and Berghaus buckles. These are not military surplus pieces, but new stuff straight from Berghaus. Like most others, these are made in China too, but to robust specs - Berghaus doesn't fool around. Laadukas, jämäkkä ja mukava kantaa! I've had one of these now for about 10 years, first it was for hauling camera equipment with me on long treks in Oz and South America now it's just used for hauling extra grub or winter gear on very long treks in Northern Scandinavia. 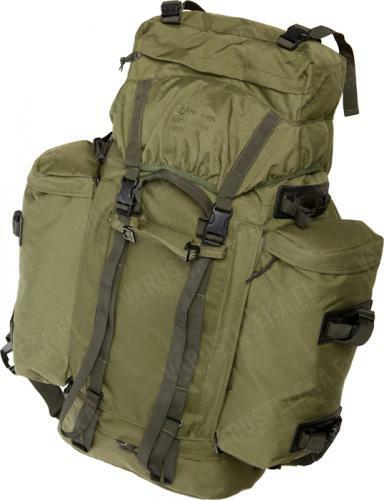 This bag has none of that adjustable harness lengths nonsense and is much lighter for it absence The material it's made from is incredibly strong and very resistant to tearing (the Australian bush is particularly rough on bags in this regards...no problems here). 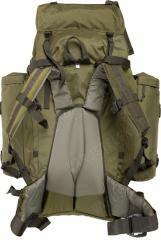 The bag is neat/slim without the side pockets (approx 70 to 80L) and massive and spacious with them (approx 100L). The zips, straps and stitching are all top notch. I am about 184cm tall and have a size 3, it might not be perfect from a sizing chart point of view but the bag still fits me very well (the chart is important but I feel the bag/harness system is pretty forgiving). All in all by far the best rucksack I have ever owned. What do I know about backpacks? Well in the past I have worked for Osprey, Lowe Alpine, MacPac and Mont but never Berghaus...and this bag tops any of those companies efforts because it is more simple (no strap or button lock harness), sleeker (not so many lose straps everywhere), lighter (by far...especially for anything near its size) and just as tough as the toughest among them...and it's cheaper to. Like I said, "the best of the best right here".